What I Blog About When I Blog About Books: NOTD: Essie "Absolutely Shore"
Today's notd is for Essie's "Absolutely Shore," one that I believe was originally released back in summer of 2011. 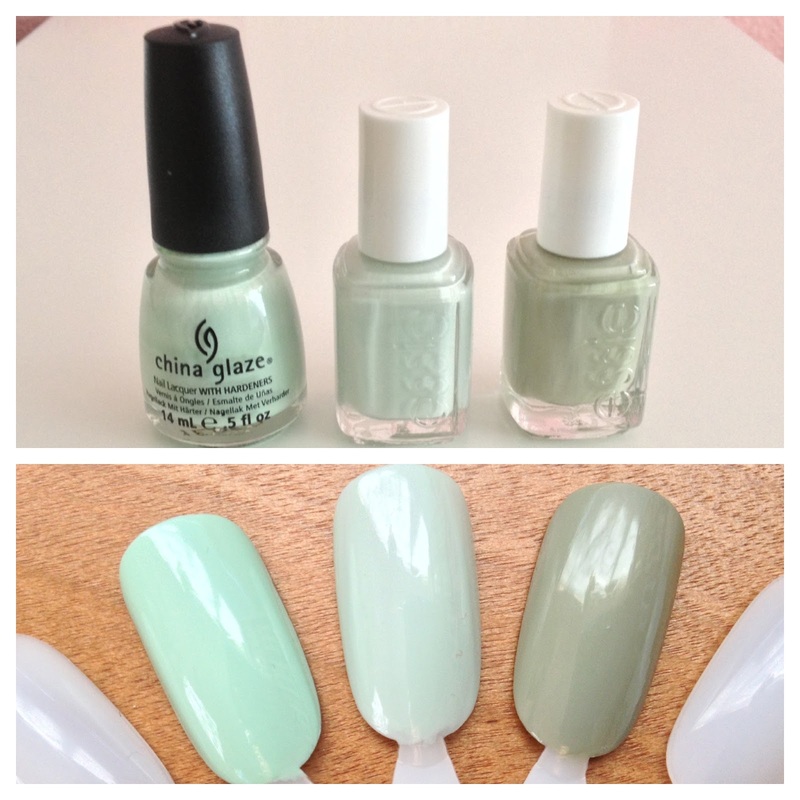 "Absolutely Shore" is a pale sea-foam green that I find to be the green equivalent of Essie's "Borrowed and Blue." Even though this polish was released as part of a summer collection, I really enjoy wearing this color during winter. I find that the polish has nice hints of grey that make a great choice if you enjoy lighter colors during the colder seasons. I found the exact hue of this polish hard to capture on my nails, so to provide extra assistance in understanding where "Absolutely Shore" falls on the light green polish spectrum, I decided to compare it with China Glaze's "Re-fresh Mint," a pure mint green, and Essie's "Da Bush," a murky, military green. You can clearly see that "Da Bush" is much greyer than "Absolutely Shore." However, if you cover up "Da Bush" to better compare the other two, I think you will agree that not only is China Glaze much brighter, but Essie's "Absolutely Shore" does have some grey hints to it. I wanted to do that comparison because I felt my photos below didn't do a great job of showing the slight grey hints in this polish that make me love it for winter. The second photo below even seems to lean slightly blue, which this polish does not at all. So if in doubt about the hues of "Absolutely Shore," consult the comparison photo above. As far as formula goes, this polish is not great at all. I needed four thin coats to make the finish non-streaky and opaque. "Absolutely Shore" was a nice relief to have on my nails after all the darker colors I have been sporting lately. And even though I especially love this color for winter, it really does work all year round. Aside from the streaky formula, it's a great versatile polish! This looks really pretty! The comparison makes "Da Bush" look very dark, but when I covered the bottle of "Absolutely Shore" "Da Bush" looked close to "Re-fresh Mint"....tricky capturing these polishes. But they look flawless on your hands! I've been curious about "Absolutely Shore"...the name gets me every time. Even in the bottle "Da Bush" looks drastically greyer than "Re-fresh Mint." I think "Absolutely Shore" and "Re-fresh Mint" are much more similar than "Re-fresh Mint" and "Da Bush."